Glutathione is a small protein produced naturally in our cells when certain required elements are present. It functions both as an antioxidant and a detoxifier and is a major defense system against illness and aging. Our glutathione level indicates our state of health and can predict longevity. Although there are more than 99,000 published papers on the beneficial effects of glutathione replacement, it is still largely ignored by mainstream medicine. protects from degenerative diseases and reduces the chances of developing cancer (click here for a list of diseases and illnesses that are linked to low glutathione levels). How do you increase glutathione levels? Increasing intracellular glutathione levels is typically a complicated process. Glutathione can be taken intravenously, transdermally or through a nebulizer. Note that supplementing directly with oral glutathione is generally not effective because studies have found that glutathione does not survive the digestive process. Furthermore, supplementing with oral glutathione can result in a yeast outbreak and gut imbalance. Injections are only minimally useful, since glutathione cannot enter into the cells themselves. It must be manufactured inside the cells (when the necessary components are available.) As Dr. Kartzinel explains, methyl B12 injections and supplementing with trimethylglycine (TMG) or dimethylglycine (DMG), folic acid and N-acetyl-cysteine can increase glutathione levels. Dr. Robert Keller’s Original Glutathione Formula is a 100% natural supplement that increases intracellular glutathione levels. This supplement does not contain glutathione (which breaks down during the digestive process), but contains ingredients that stimulate the production of glutathione, including: vitamin C; N Acetyl cysteine, L-glutamine, N Acetyl D-glucosamine, quercetin, milk thistle extract, alpha lipoic acid, cordyceps and conjugated linoleir acid. 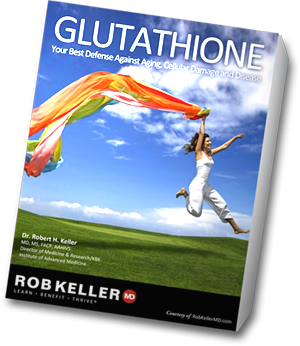 Find out more about Dr. Keller’s Original Glutathione Formula here. Watch Dr. Oz’s video about the importance of glutathione here. Glutathione: The Mother of all Anti-oxidants by Dr. Mark Hyman. Email me at spirityoga@live.com to receive a coupon code to get 50% any single product or combination pack. What is Dr. Keller’s Original Glutathione Formula?